[Ottawa – April 17, 2015] There isn’t a lot to note in a rather moribund political landscape. Stephen Harper’s small but significant lead is quite impressive in light of the preponderance of seemingly threatening forces arrayed against him. Our latest tracking shows that confidence in national direction is teetering to historic lows, matching the historic negativism surrounding the direction of the country and the government leading it. Outlook on the economy is nothing short of gloomy and his personal approval levels are the worst of all leaders. 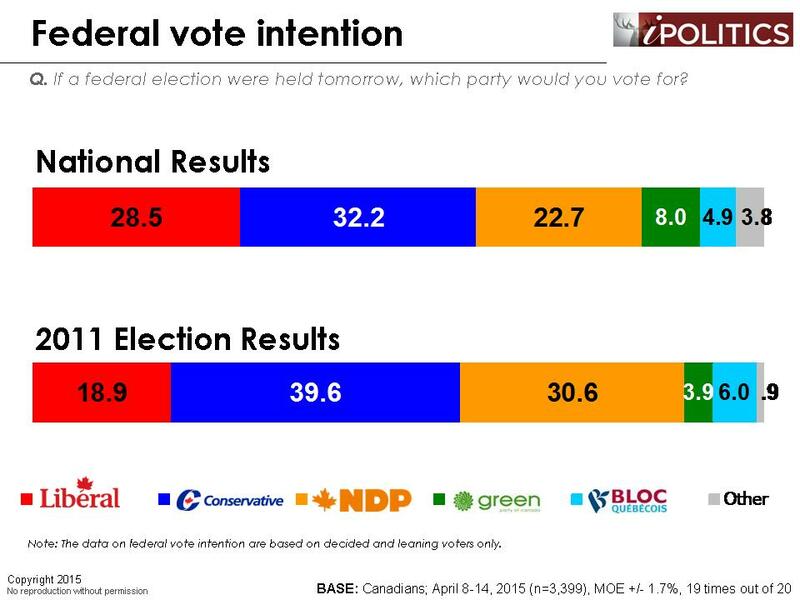 And yet, he has re-established a modest but significant lead over Justin Trudeau’s Liberals. The somewhat revitalized NDP continues to make this a three-way race, but progressive voters are now arrayed across a four-way range of options in what may be a very advantageous political arithmetic of vote splitting favouring the Conservatives, who are hovering just north and south of 30 points in a listless voter landscape. The big question is why are the Conservatives leading given the depth of discontent with the country, the economy, and the leader? Apart from the obvious answer that none of the current choices is lighting it up with relatively disengaged voters more tuned to hockey playoffs than the budget and still remote election machinations, we have to consider the question of who is making the best connections to date on the critical domains of values and interests. The surprising answer is that Stephen Harper is currently registering the best connections, not withstanding clear evidence that many of the values he is championing are increasingly the values of yesteryear. Moreover, it is difficult to explain how in a country where only one in five think they are better off since he gained his majority, and when optimism on the future is registering the lowest levels in over a decade, that he can me seen as the best choice for one’s “interests”. And yet, he is. How sustainable is this current higher position? It is difficult to say. As attention on issues and leadership inevitably rises in the coming months, the focus on security and terror will most likely fade and focus will once again return to a moribund economy which threatens to remains stagnant for another decade. Throw in a large dollop of the Duffy circus, and its potentially corrosive impacts on Stephen Harper, and one would have to question the sustainability of this position through to the fall. It is, however, clear that Mr. Harper has managed to steer himself and his party upwards and back into a position comparable to that he held at the six months before his surprising majority in 2011. In fact, the Liberals and Conservatives are in almost identical positions and the NDP are seven points better than in late 2010. There are, however, deeper challenges confronting Mr. Harper this time. Due to the small sample sizes in the various regions and demographic groups, results tend to fluctuate from week to week. However, the overall patterns have changed little over the past month. The Liberals continue to dominate Atlantic Canada, while Quebec remains a tight, four-way race. The NDP have been squeezed out of the Ontario race, where the Liberals and Conservatives have been see-sawing back and forth for some time. The Conservatives remain largely unchallenged in the Prairies, except for Manitoba where the Liberals appear to be a very real force. Finally, British Columbia remains a highly fluid race between the Conservatives, Liberals, NDP, and Greens and it would be unwise to make any predictions about where the province is headed at this time. 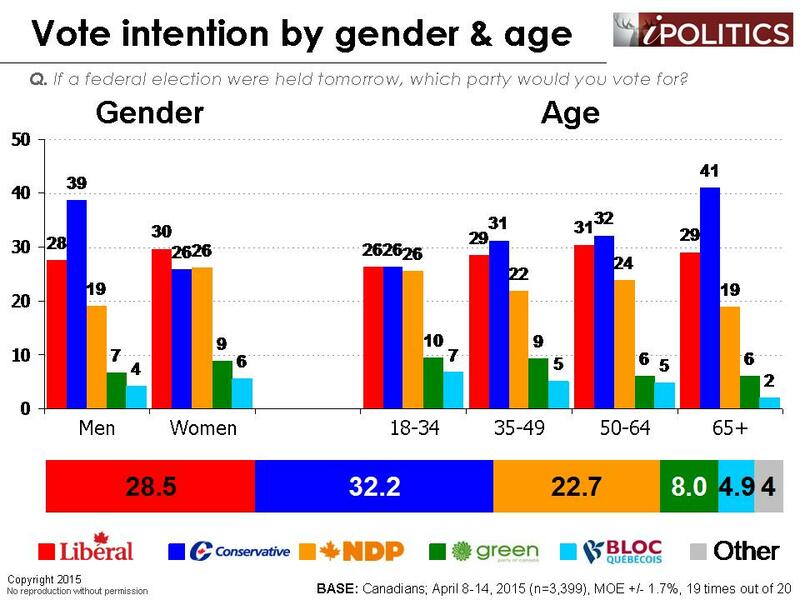 The Conservatives have a very strong lead with men, but can not seem to make any headway with women. Indeed, if voting were limited to women, Mr. Harper would lose decisively to the Liberals. 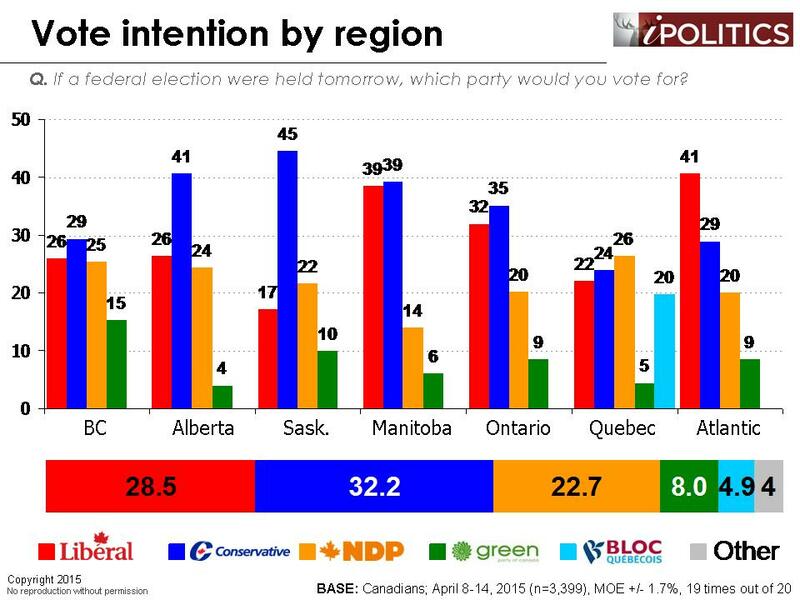 The Conservatives continue to enjoy a huge lead with seniors. The ultimate choices of older Canada will ultimately be critical to the outcome of the fall election. New Canadians are moving unpredictably back and forth between the Liberals and Conservatives. Very little appears settled in terms of demographics or regional patterns at this time. 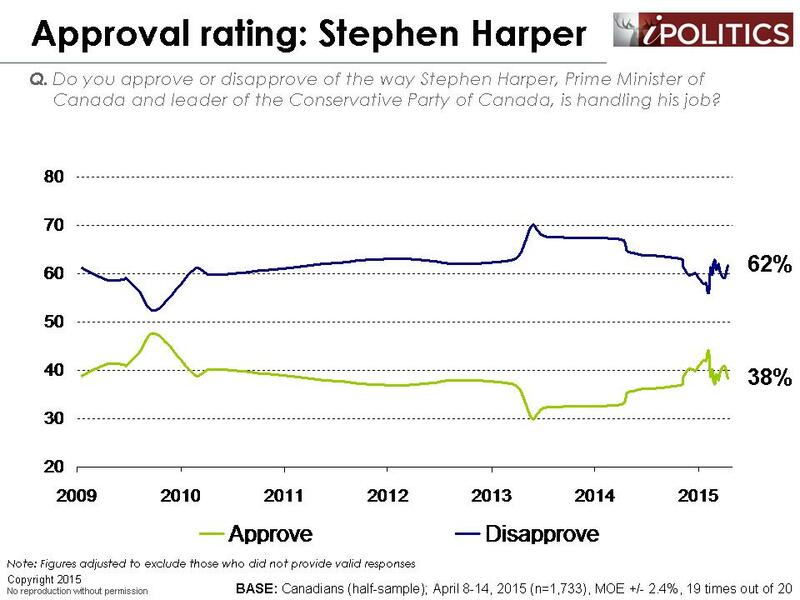 Is Harper lead grounded in rising approval and declining approval for his opponents? There has recently been speculation that Stephen Harper’s strengthened position is based on rising personal numbers and declining scores for opponents, particularly Justin Trudeau who it has been claimed is “plummeting”. 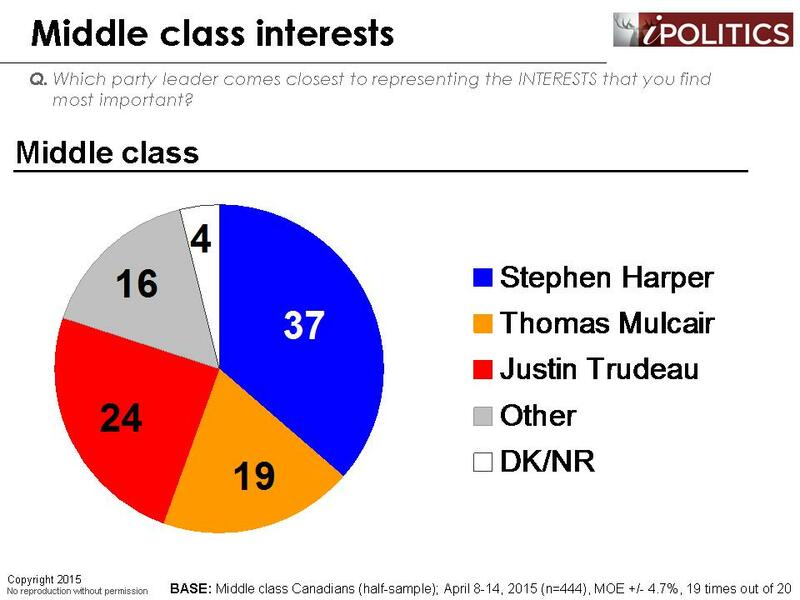 In our regular tracking, we find no evidence to support this explanation for Mr. Harper’s modest lead this week. 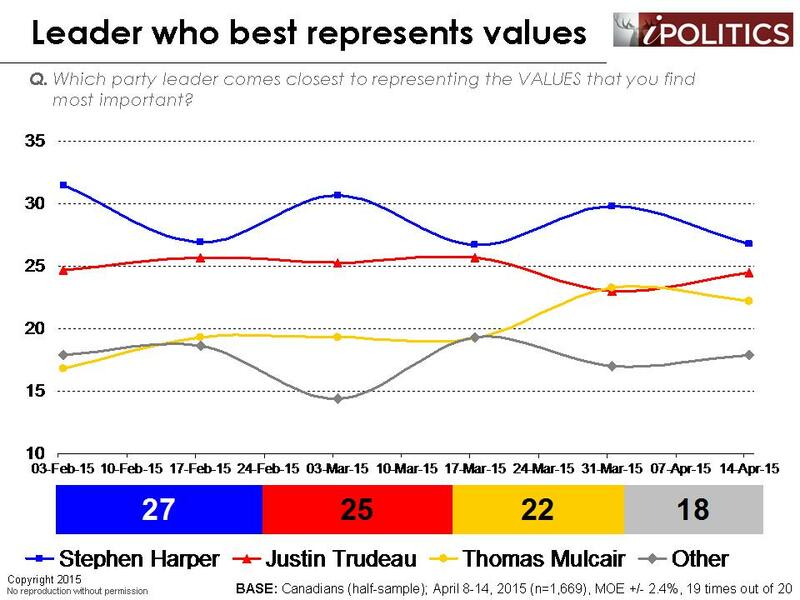 Thomas Mulcair has the best approval ratings and remains in third. 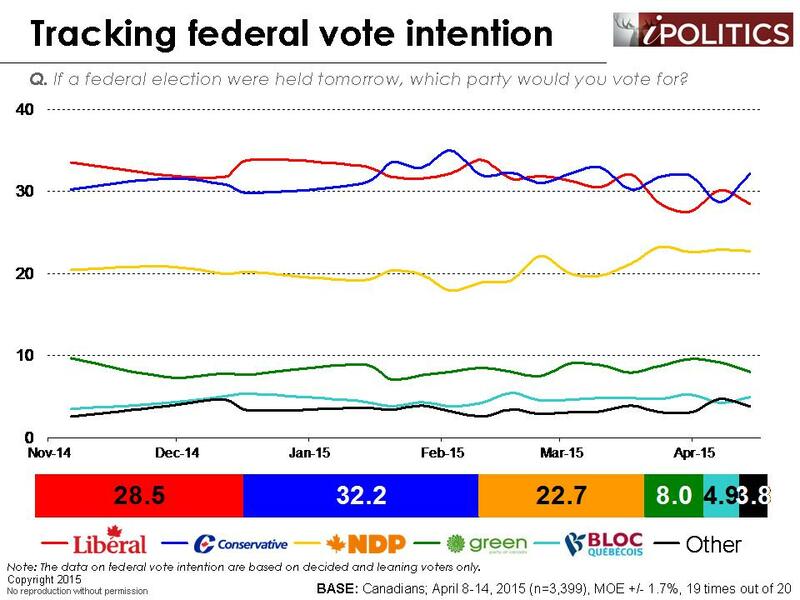 Elizabeth May has similarly excellent ratings, but is not in the national race. 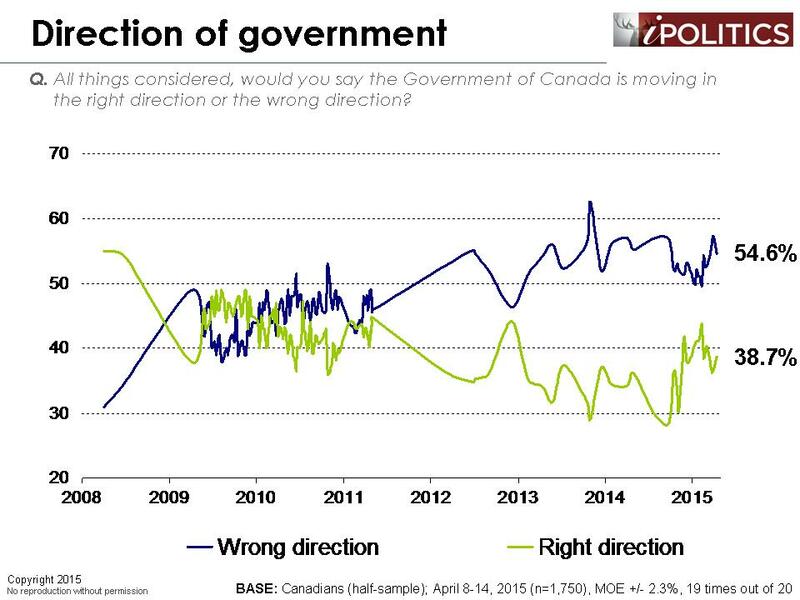 While Mr. Trudeau’s numbers dropped to a polarized position toward the end of 2014, they have been stable for 2015. 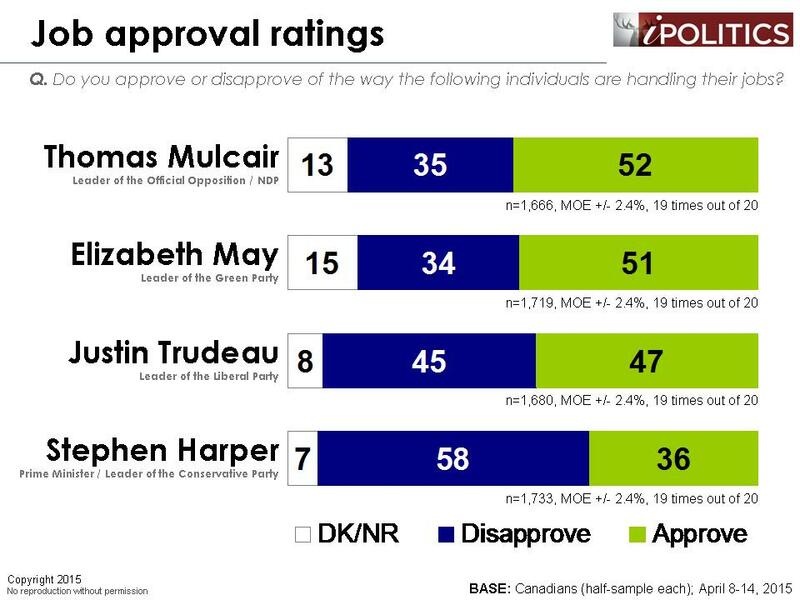 Stephen Harper, on the other hand, ranks last among the four leaders tested and a clear majority of Canadians disapprove of the way he is handling his job. Meanwhile, contrary to what some have speculated, there is no evidence that Justin Trudeau is in decline. 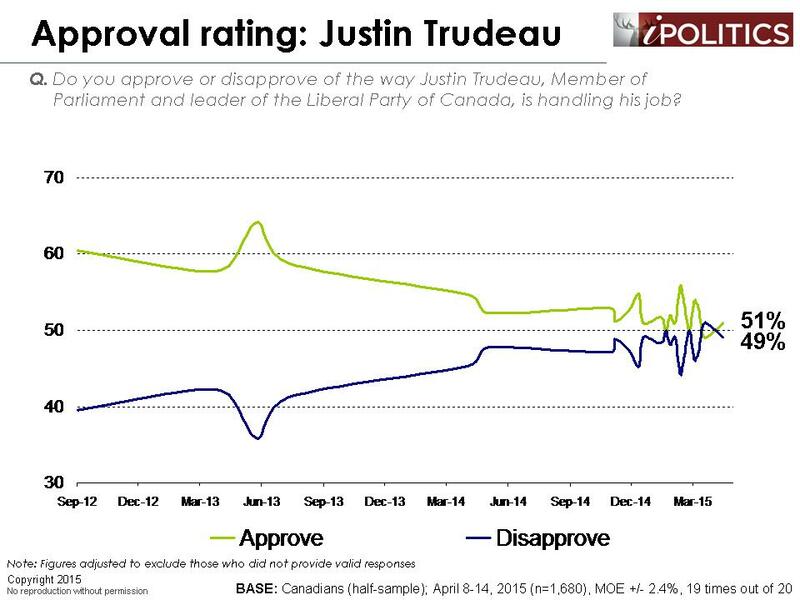 He has been polarized – which roughly equal proportions of Canadians approving and disapproving of his performance – for some time. In short, the connection between approval ratings and vote intention is weak and confused and the trajectory of tracking on approval does not support the conclusion that anyone is plummeting. If approval isn’t the key to why the Conservatives are doing well, what are the keys? We can dismiss the idea that it is reward for national direction or economic stewardship as the evidence here clearly flies in the face of those hypotheses. We may be on more solid ground for understanding the relative positions if we turn to values. The case for a values advantage is less clear than in the equally important realm of who best reflects Canadians’ interests. Here, Harper enjoys a larger advantage which we believe is rooted in greater volume, clarity, and consistency in his economic messaging. 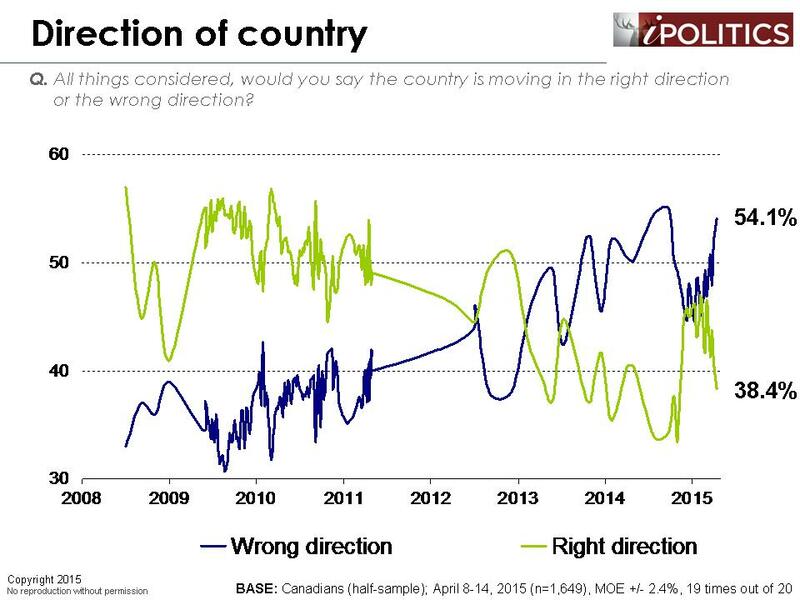 Mr. Harper retains an edge in terms of who Canadians believe best reflects their values, but this advantage has diminished in recent weeks (this is an important finding because of how values are strongly connected to emotional engagement and party choice). Similarly, Mr. Harper is seen as best able to represent the interests of Canadians, while progressive party supporters oscillate between the Liberals and the NDP. These findings are most likely linked to the fact that progressive parties have been unable to wrestle away the podium from Mr. Harper, who has dominated the airwaves with strategic messaging about the budget and other issues around values. Indeed, everyone is hearing about Mr. Harper and his government, while other parties are struggling just to get noticed. Our focus is on self-defined middle class membership, seeing it more as a mental state of belonging, rather than an economic category. This is a more straightforward approach, as there are over a hundred income-based definitions of “middle class”. The relationship to education is not surprising. Clearly, people with higher incomes and educational attainment are more likely to locate themselves in the middle and upper classes. 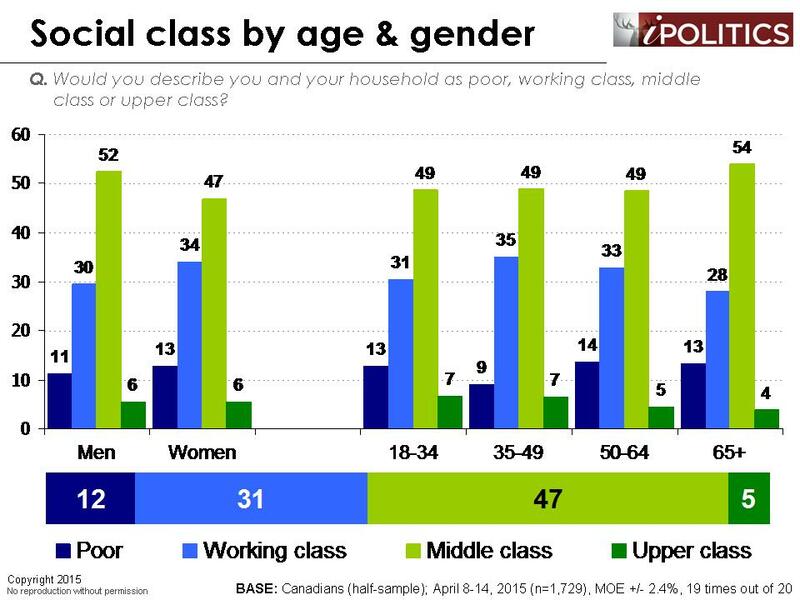 What is more surprising is the positive correlation between middle class and being Francophone, and being over 65. The language breaks are surprising. This is also connected to consistently higher scores among Francophones for restarting middle class progress. Evidence points to the continued salience of restoring middle class progress as one of the pinnacle issues which will shape the outcome of the next election. Our research shows that the public almost unanimously believe that a growing and optimistic middle class is a precondition for societal health and economic progress. Yet, by very large majorities, the public feel that the middle class is pessimistic and shrinking. “Middle class economics” was the cornerstone of President Obama’s State of the Union Address and it has figured strongly in the narratives of both Justin Trudeau and Tom Mulcair. 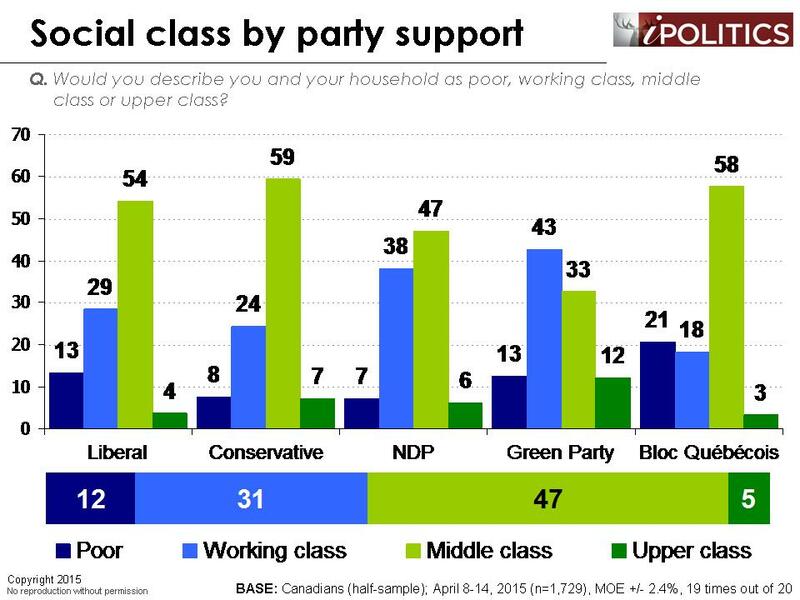 The only leader who isn’t really taking about middle class decline is Stephen Harper. This is understandable since the end of progress thesis doesn’t resonate with his generally rosy depiction of the state of the economy. It is also the case that the key drivers of middle class stagnation are linked to rising inequality at the top of the spectrum, as well as the diminution of public institutions, and many associate this with the failure of the policies of austerity, trickle-down economics, and tax relief which are central to Mr. Harper’s economic policies. It will therefore come as a nasty surprise to parties of the center and left to note that while they are preparing or attempting to convey their approach to this problem, it is Stephen Harper’s Conservative Party which has seized the current leadership of the party best poised to satisfy the interests of the middle class. This rather surprising finding may be rooted in the continued mantra of Canada’s economic action plan and the plethora of tax goodies targeted at portions of the middle class sprinkled in the upcoming budget. As importantly, by choice or some other form of exclusion, the voices of the left and center parties on how they will solve this critical problem are largely mute or at least not registering with the middle class voter to date. For the progressive parties to succeed in the next election, they will have to wrestle the mantle of middle class interests away from Stephen Harper. The field dates for this survey are April 8-14, 2015. In total, a random sample of 3,399 Canadian adults aged 18 and over responded to the survey. The margin of error associated with the total sample is +/-1.7 percentage points, 19 times out of 20. Imagine if we had a much more or even fully-proportional system in place over the past generation (say, twenty five years). With no party having any realistic chance at over half of the popular vote, parties would have had to eventually collaborate. And that would have led to compromise and the ideals of a greater swath of Canadians being reflected in policy. That is, a more real and healthier democracy. Instead we’re looking at a party that has declined from just under two fifths of the popular vote to just under one third and yet has a real shot at staying fully in charge. That’s because even if it does only get a minority government, it looks likely to benefit from such a divided opposition that it would be a minority in name only. Can we fairly safely assume those ‘wrong direction’ graphs would soar if an even larger majority is boxed out yet again for four years? Yes. But more tragically, we can also safely assume that most Canadians would still not take proportional representation seriously. To me, that makes for not just a “moribund political landscape” but a moribund democracy.